In case you missed them last year (and a few weeks ago for Cute Food Saturday) click here for the amazingly fool-proof process to make these adorable bunny cakes! 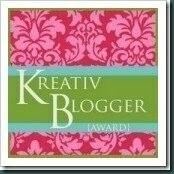 And thank you to Geri from Heart N Soul Cooking for giving me the Kreativ Blogger Award! 4. Name seven things about yourself that others don't know. 5. Don't forget to notify your seven Bloggers about their award and post a link to their blog. Laura of Hey What's for Dinner, Mom? And now onto seven things about me which is getting increasingly hard with each award that requires this because I don't want to repeat things! 1) For about two years when I lived back home on the Outer Banks my best friend Brittany and I would go bowling every single Friday or Saturday night until 1 or 3am unlimited for $12. Still, I think my highest score was like 120! 2) In the past three weeks I have been to two new states I've never been to before - Iowa and Nebraska! 3) Once when I was 4 or 5 I wrote my name on the wall in pen and thought I'd outsmart my parents by saying my 1 year old brother did it. 4) I don't have my high school diploma, I have a GED instead! 5) I used to have a massive crush on "JTT" aka Jonathan Taylor Thomas. Many teeny bopper magazines were sacrificed for me to plaster his face in my room and locker. 6) I've never seen a bunch of super famous movies like Gone with the Wind and The Sound of Music. 7) I need to purchase anything with my name or initial on it, even though I'm 25 and not 7. Oh I did not know you had a penchant for initialized items! Hee hee, that would also explain your affinity for cute and adorable stuff. Thanks for the award, Christina! Love you, and HAppy Easter!! Happy Easter to you too!!! Thnks for the award :) I used to be slightly obsessed with JTT too. Thank you thank you for the award, Ms. Christina! I HAVE to purchase anything with Alexandra (I've never seen anything with Allie on it). They rarely even have Alexandra these days. Happy Easter! Happy Easter! You need to see the Sound of Music!! I came over from Reader to say nice bunny ears, and then saw the award too! Hmm, sounds like we would be good bowling partners! Your bunny cakes made my day!! I LOVE bunny rabbits, they're my favorite animal ever!! Thankyou for thinking of me your Chicago bloggie friend. :) Which reminds me, we need to meet up soon!! I accepted a position in dental school at Tufts and I'm moving to Boston in August!! I love that smile!! So cute! I would love to live on the outer banks and I'm jealous. Thanks for the award, I have another one I need to post and pass. I earned it for having gonads...YES!!! You adorable cakes look mouth-watering - and you look super cute in those bunny ears! Is Taylor still visiting? How did I miss these cakes before?! It's nice to learn more things about you Christina! Love the bowling story, I LOVE to bowl! thanks sooooooooo much for the award, i shall have to put it up this week! i didnt know you had your GED, thats kinda cool! um i totally got caught vandalizing lockers once, and had to spend three days cleaning them all in the school! dang it!